Approaching Cappielow the Rovers support were a bit confused to hear the theme from Allo Allo and other Gallic tunes. The home fans were French themed in appreciation of Fouad Bachirou in what seems to be his last appearance for the Ton. There was a large banner many, many French flags, a few stripy jumpers, berets and tashes, etc… The temptation to do the last match report of the season in the style of Allo Allo’s Officer Crabtree was very bog. The Rovers lined up with only one change, Clarke replacing Graham, looking to win three games on the bounce for the first time this season. Doing so would mean that the Rovers would overtake the hosts and claim 7th place. Ex-Par Young shot wide then Clarke hit Baird’s header first time but it was also wayward. The Rovers support, some of whom were also in fancy dress, were already in good voice which they maintained throughout. 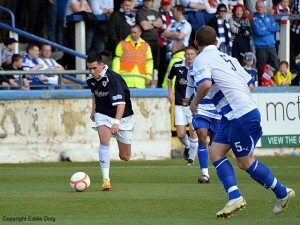 Jamie Walker started well and in the 8th minute got to the by-line having caused panic in the Morton defence. Thomson then had Combe in the home goal scampering when his deep cross went just past the far post. Tidser shot low from a long way out however the Rovers looked the keener side early on. 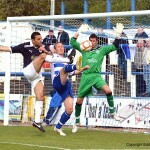 Baird had a shot blocked then Jamie crossed but Allan Walker failed to find the target. McDonald shot wide then Jamie Walker opened the scoring. The Hearts loanee collected the ball in his own half and ran at the Morton midfield, continued past challenges and got into the 18 yard box where he had only Combe to beat. Jamie shot low past the experienced keeper and had the Rovers support on their feet. It was a great, great goal but a nightmare to describe in a match report without TV replays! Morton tried to get back into the game in the 20th minute when Weatherson fired in a free kick. 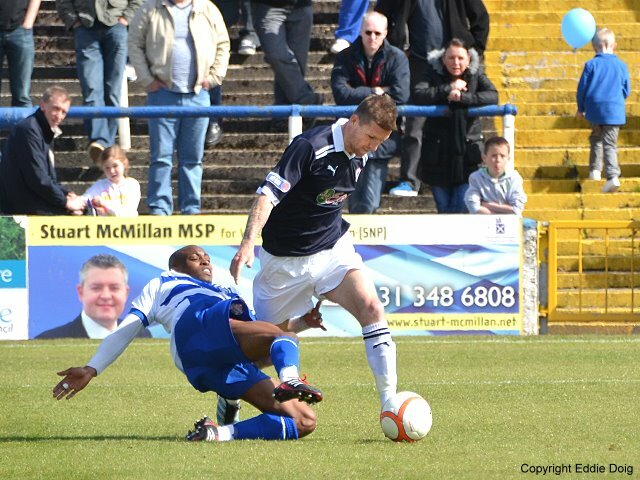 Dave McGurn dived well to his left and pushed the shot away. Dyer was continuing his good late season form and he played in a dipping cross which Aldo collected and Combe did well to block his effort. Grant Murray deflected a shot which fell to Morton’s Campbell in-front of goal and he fired his shot well over but was spared some of the embarrassment by the offside flag. 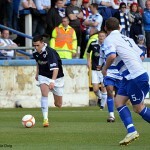 Jamie Walker easily beat to two men and Baird took his pass first time shooting from 23 yards. Combe dived to his right plucking the effort from the air. On the half hour Weatherston, who been more than firm in his marking of Clarke, went down after Pat tried to block his pass. As the Morton number 5 lay on the ground Clarke obviously thought he was simulating and said so. 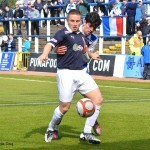 Miraculously the big defender sprang to his feet and pushed at the Raith man getting right into his face. The referee decided to book Clarke and Weatherston also only saw yellow. This was a let off for the home side who saw McDonald shoot over and Dyer mop up after Campbell tried to take advantage of a sloppy Rovers free kick. Walker had another chance from the by-line forcing another Combe block. Morton were trying to limit Jamie Walkers involvement and he began to show the effects of some hefty challenges late in the half. 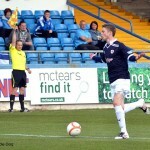 Raith finished strongly with Clarke shooting just wide and Davidson’s header from a corner agonisingly close. The second half started a little late and McGurn was quick on his feet to cover an uncharacteristic Hill error. Then in the 51st Jamie Walker headed to Baird from halfway, John played the ball forward low for Clarke to run onto. Pat outpaced his Ton marker and put the ball past Combe from 19 yards to make it 2:0. The home support saw their chances of ending the season on a high end only three minutes later when Allan Walker played in his namesake wide. Jamie’s cross from the right found Clarke at the back post and he powered his header past Combe who got half a hand to it. At trios zero the Rovers looked good value for their lead. 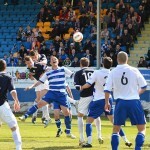 On the hour there was a scramble at the back post and the ball fell to Morton’s Graham but he couldn’t hit the target. 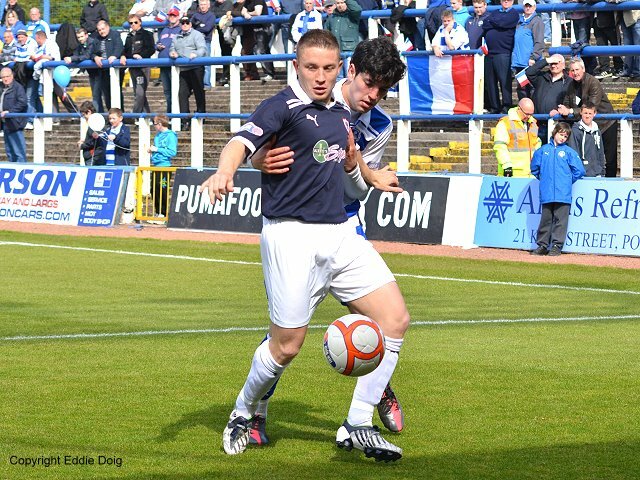 Ross Callaghan came off the bench in the 65th minute and looked eager to be involved, he again did well. In the 67th minute a few seconds of play showed the difference between the two sides: McDonald stopped chasing a ball but Davidson got to it by the corner flag, with the support of teammates and some crisp short passing the ball was played out – attitude and skill in equal measure. 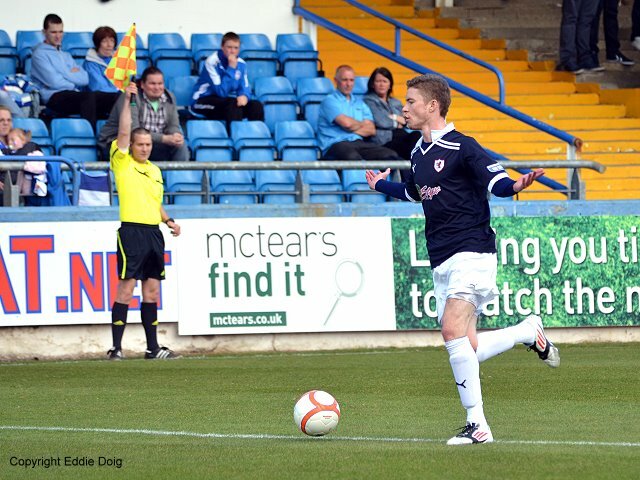 Casalinuovo went on for Clarke and saw McDonald shoot at McGurn from 18 yards. In the 76thminute Hawke (Jnr) headed across goal from 9 yards and it sneaked in off the inside of the near post. His lack of celebration hinted it was not what he’d intended – the goal was greeted by little more than a gallic shrug from the home support. Dave McGurn blocked a shot with his foot when Di Giacomo shot low but that was as close as the home side came to getting back into it. Baird hit the back of the net but play was called back as the man who set him up – big Damian – had been fouled… Allan Walker’s resulting free kick dipped just over. 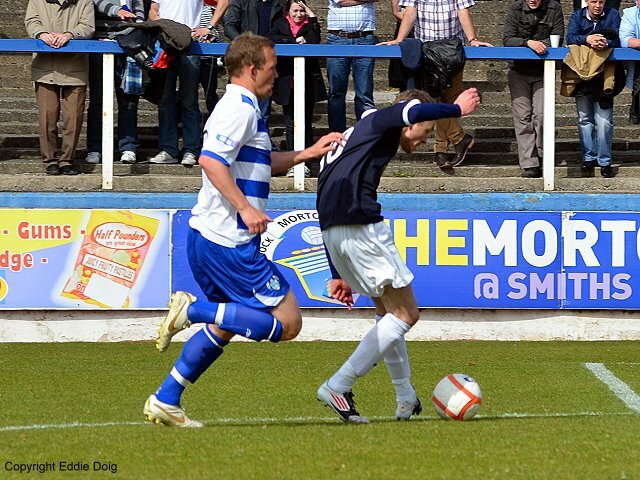 Morton saw McGurn claw away an effort but McDonald who’d stayed on his feet was offside. 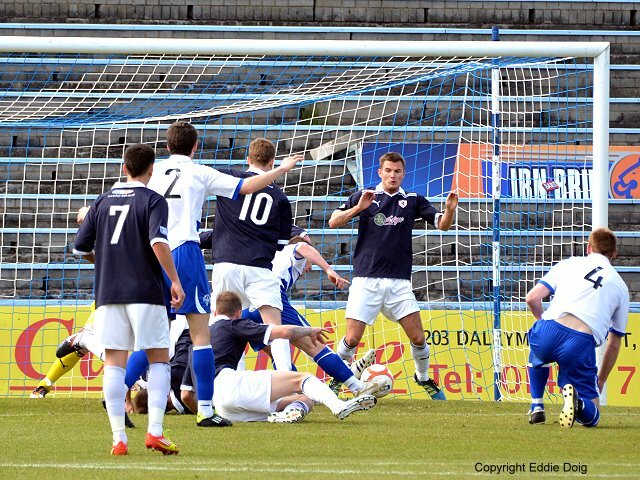 As time ran down Lewis Vaughan came on for his Raith debut and Hamill had an acrobatic shot from the edge of the box saved. 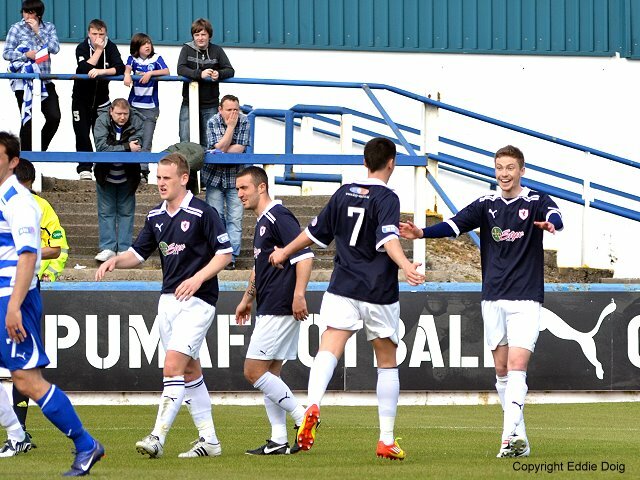 The Rovers players remained to receive and return applause from the travelling support. The performance showed how well the Rovers can-can play Davidson, Clarke and Dyer all deserved praise and Jamie Walker left us with a great goal and performance to remember him by. Morton: Combe, Evans, Weatherson, Graham, O’Ware (Di Giacomo 62), Young, Smyth, Bachirou, Tidser (Frizzell 86), MacDonald, Campbell (Hawke 73). Subs Not Used: McGinley, Orr. Raith Rovers: McGurn, Thomson, Hill (Vaughan 85), Murray, Dyer, Jamie Walker (Callachan 65), Allan Walker, Davidson, Hamill, Baird, Clarke (Casalinuovo 70). Subs Not Used: Laidlaw, Williamson. YC: Davidson, Hill, Clarke, Callachan. Welcome to todays game from Cappielow. Just to advise that todays scheduled updater, Chris Hynd, has been advised to stay at home on health grounds today (he has a very bad back), so there will be a minimal number of updates being posted from my home laptop today. Apologies, but this was an unavoidable situation.